Came home one day this week and the dishwasher was broken. I had started a load of wash before I left and it stopped in the middle of the cycle with partly cleaned dishes and a tub of water standing at the bottom. It was unresponsive and the lights wouldn’t light. Luckily it was a cheap fix. It was sort of quick (a couple of hours) but if you have the same problem and found this post then it will be a thirty minute job total. I assume this dishwasher came new with the house so that would make it about 12 years old. What a piece of junk! Just kidding, 12 years is a good time, but you know what’s better? More years. I’m getting a fence put in and I don’t want to have to buy an appliance on top of that. 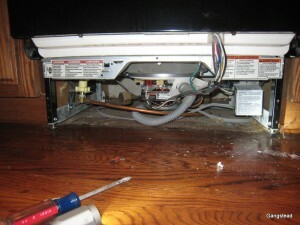 The first thing I did: I heard that a common failure point for dishwashers was the latch on the door. It gets a lot of use and there are a couple relays in it so I thought maybe one of those was out and the unit was shut off because it thought the door was open. It wasn’t too hard to do, and I verified the relays with my multimeter. I even undid the screws that secure it to the counter adn rolled it out and looked for … I don’t know what I was looking for. It was plugged in. After a little research online I found out what I SHOULD have done. The first thing I should have done: Since it wouldn’t power up then something is wrong with the supply of juice. If it powered up but didn’t turn or pump then I would look at a motor but this was more basic than that. No power. So start from the wall (figuratively, you don’t have to slide it out). The power chord isn’t going to fail, so where does it lead? Disconnect the power! Then remove the toe plate. It’s just two screws on the front of the unit. Next go to the silver box (indicated by my awesome MS Paint arrow). 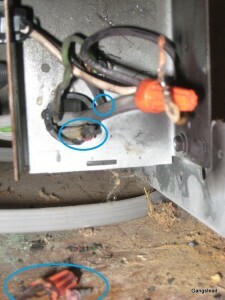 This box is where the generic extension chord is hacked off and spliced into the power for the washing machine. On this Whirlpool it’s on the right side of the unit. You did turn the power off, right? Because the next step is to open it up. Don’t know how to turn the power off? Step 1: Call an electrician because you don’t want your first time to be based off of some yahoo’s instructions on the internet. OK. Power’s off. Open it up (one screw). If your machine broke like mine then diagnosis is complete. You know you're in the right place because of all the WARNING and DANGER signs. Those are for guys who don't know what they're doing (like helmets), but not for me! I was unable to take a good photo of the carnage in there, but it was obvious this was the problem because a charred half of a wire nut fell out and the end of the wire was burnt black. I cut off the charred bits of those wires and stripped some back and put a new wire nut on. I also changed out the other wire nut just for good measure. I don’t know why it failed after a decade of service, but I can speculate. If your dish washer is fixed now and you don’t care why then stop reading. My engineering speculation is if the motor is going out it might be drawing more current when it first turns on. It didn’t look like there was a fuse anywhere so there’s nothing to limit a current spike, so that could cause the wire to warm up. It looks like the solid core wire (the one that goes to the dish washer, the power chord was braided) broke off at the end. If any of those little braids were still making contact they would have fizzled when trying to take the whole load and that’s what burned the wires. 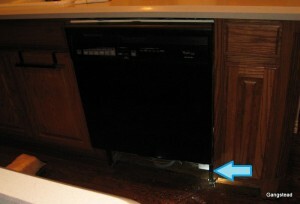 I know the dishwasher won’t last forever, but I hope this gets me a couple more years out of the appliance.